South Africa is seeking a change in World Cup rules to allow visiting teams to be based in neighbouring countries during the 2010 finals. Danny Jordaan, chief executive of the 2010 organising committee, said other African countries should be involved as much as possible in the continent's first World Cup. "This is Africa's World Cup and we are making a case to Fifa for a change in the rules," Jordaan said. Under existing rules, the 31 visiting teams can set up training camps outside the host country before the finals. But they have to move to South Africa at least seven days before their opening match and remain there during the tournament. Jordaan said organisers will ask Fifa to consider allowing teams to stay at bases in neighbouring countries and travel to South Africa on the day before their matches. The bases would be within a 90-minute plane journey of the match venues. Brazil might wish to stay in Portuguese-speaking Mozambique, he suggested, and Swaziland would be another suitable location for a training camp. He said he believed Fifa would be sympathetic to the proposed rule change. Jordaan said he expected some 350,000 to 450,000 overseas visitors and fans for the finals. If fans followed their teams to bases in neighbouring countries, it would also ease pressure on accommodation in South Africa, he added. Jordaan said measures would be put in place to ensure local fans, especially those from the townships, would not be priced out of the World Cup. "There will be affordable tickets. There are many people who have supported the game for many years and they must have access to the event. Fifa understands this," he said. But he said ticketing policies were unlikely to be decided by Fifa before next year and that they would have to take into account the problem of cheap match tickets being resold on the black market for several times their face value. "This could also be a security issue if fans from one country end up in a part of the stadium where they were not expected," he said. Jordaan said South Africa would ask Fifa to encourage teams to train in stadiums being set up in the townships as another means of bringing the World Cup to local fans. Jordaan said South Africa also wanted to extend the highly successful use of fan parks with big screens at last year's finals in Germany for supporters without match tickets. He said South Africa had asked Fifa if they could set up fan parks outside the stadiums, in the townships, in other cities not hosting matches, in other African countries and in all countries of the 31 visiting teams. "Fifa have not come back on this yet," he added. 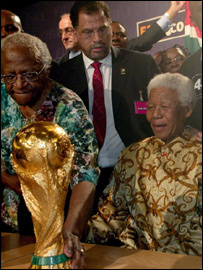 Jordaan said Africa's first World Cup had to be a successful event. "We cannot afford to fail," he said. "It is in everyone's interest for this to be a success and we are going to work very hard to make it happen."